This button displays a menu similar to the one below. 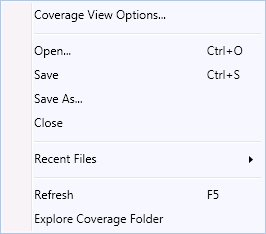 This button lets you select multiple coverage files whose data will be merged into the active coverage file. This button lets you select a trend file to load trends from. This button displays a menu similiar to the one below. 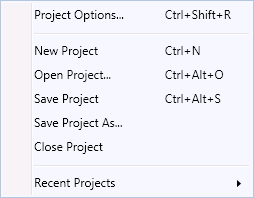 This button will execute NCover with settings from the current project. While NCover is running, clicking this button will force NCover to stop running and gather coverage data. This button opens and closes the statistics panel. This button opens and closes the output panel. This button opens the Report window. This button opens the Script Helper window. This button opens the Application Options window.